J.J. Abrams introduced the crowd at Star Wars Celebration to a new droid from The Rise of Skywalker today. He is a buddy of BB-8, and could very well be the droid we've heard so many rumors about involving Keri Russell's character. 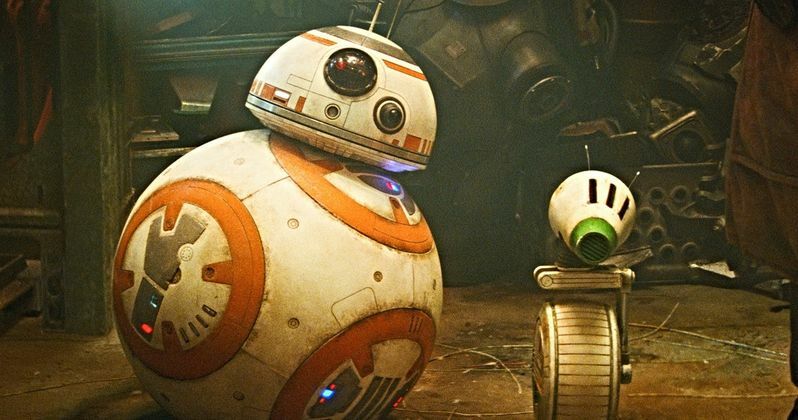 The new droid is named Dio and he is very simple looking, but as both BB-8 and R2-D2 prove, looks don't really have anything to do with abilities and powers. Dio kind of looks like a broken bullhorn on a unicycle. The Dio who appeared at Star Wars Celebration was actually custom built for the event. J.J. Abrams also showed off some concept art for Dio and it looks like his look may have been based on a duck or at some point the design went in that direction. He has a face, which is a bit like a duck's bill, but the comparison ends there. There are also some very different drawings from how Dio's finished look ended up. Neal Scanlan and the creature and robotics team are responsible for making Dio come to life. J.J. Abrams also snuck a Beastie Boys reference into The Force Awakens with an alien Resistance fighter named Ello Asty, named after the hip hop trio's eclectic 1998 album Hello Nasty. However, the name was suggested to the director and he did not come up with it on his own, though he is a big fan of the group. Abrams also liked it since the name's four syllables phonetically spell out "El Oh Es Te" (or L-O-S-T for Lost). Maybe Dio has an even deeper meaning than we're thinking of right now. Dio looks like the perfect buddy for BB-8 and they even sound somewhat similar. With that being said, we have yet to see the new droid in The Rise of Skywalker, so it's going to be very interesting to see what he can do when the time comes. He'll definitely have some kind of secret abilities that will probably amaze us. In addition, social media is already exploding with people who think Dio is adorable, so he could end up being the Porgs of The Rise of Skywalker in terms of merchandising. We'll just have to wait and see. While we wait, you can see some pictures of Dio below, thanks to the Rotten Tomatoes Twitter account.